My late father, Jan Albert Iverson, was a computer programmer by profession. He worked at a large corporation for years. He also had his own small side business, too. While going through my parents' belongings at their house before we put it on the market, I came across one of my dad's business cards. This was not a business card from the large corporation where he worked, but from his own business. 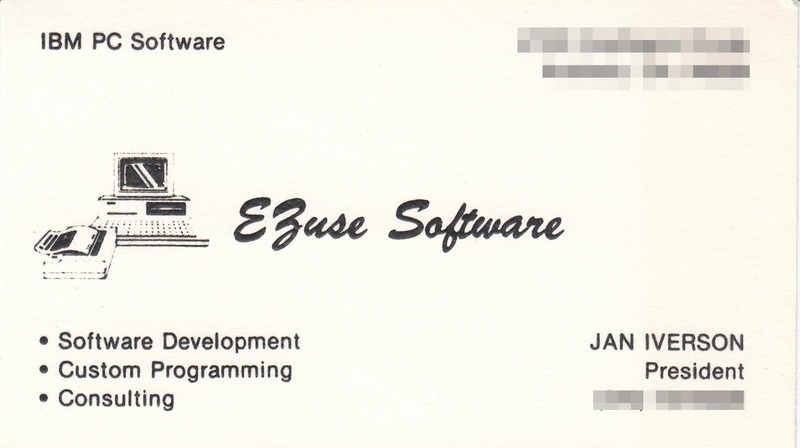 His business was called EZuse Software. Two of the products developed were for educational use. They were called Quiz Master Construction Set and USA Construction Set. Quiz Master Construction Set was software for teachers or anyone who wanted to create quizzes for students or for self-testing. The USA Construction Set was set up for educational questions about the states in the USA. Atari Mania lists and has links to the Quiz Master Construction Set and the USA Construction Set. If you click on the link for the USA Construction Set, you will actually see pics of the program's floppy disks. Pretty neat. "Ever hear of a bouncy, colorful, musical real estate quiz? How about a perky multiple-choice biology exam? Ezuse Software's Quizmaster Construction Set can provide either one, as well as a whole range. of quiz possibilities, from riddle-guessing games to foreign language tests to Trivial Pursuit game questions. You decide on the subject and type in the questions and answers." "EZuse has ported its popular and inexpensive 8-bit Quiz Master Construction Set over to the Atari ST...."
"Thanks for the positive review of USA Construction Set..."
Archive.org has a copy of the USA Construction Set Manual on its website at the link above. Pretty cool! I'm so proud of my dad and that he created his own business. He was always a hard worker and provided for his family very well. I love him and miss him so much. Have you found any business cards for your ancestors? That's a nice find. I think any connection to out parents is wonderful. How exciting to find so much information about your dad's side business online! He must have been a very talented programmer. I had a similar experience when going through my parents home after their passing. It's a warm and comfortable feeling. Like discovering something new and exciting about them in a way. Enjoyed your post. How wonderful to find that card... every time I find something new on my parents, it opens up another window to their lives... Just love being able to know them other than as parents. Thanks for sharing, Jana. I had a similar pleasure when clearing my parents’ house after their deaths (both in their 90s), when I came across a business card for my mother, advertising her dressmaking business. I had never seen this before. I knew Mum had been apprenticed to a tailor at the age of 14, and throughout my childhood, she did sewing for people from the small boxroom in our house - and was still making her own clothes in her 80s. But this card was in Mum’s maiden name, so was dated prior to,her marriage in 1938. It is only a small bit of blue card, but still precious to me. Oh! What a wonderful discovery Sue! Such a special family heirloom! What a great discovery! It's always so cool to see our loved ones in a different light. I haven't found any business cards, per se, but I did find some printed receipts with my great-grandfather's business information at the top. The pages were from the 1920's! So great that you found links to his business online. He obviously knew what he was doing, very talented man!